“None of these technologies are isolated, or isolating, systems. People are not hooked on gadgets– they are hooked on each other. The new media is the new neighborhood. This is the era of free agents and the spirit of personal agency. But it is not the World According to Me– it not a world autonomous and increasingly isolated individualists. Rather, it is the World According to the Connected Me. This new book, Networked: The New Social Operating System by Lee Rainie (of the Pew Research Center’s Internet and American Life Project) and Barry Wellman (of the University of Toronto’s NetLab), to which I was directed by Howard Rheingold’s terrific Net Smart, is a refreshingly no-holds-barred, full-throated advocacy for the power of the network to improve lives, learning, and society. The book, sadly, is not a complete success; at times its narrative flattens into research-report data drudgery, and sometimes its voice speaks about contemporary digital lives to its readers as if we lived on Mars or in the 19th century: much of what is explained requires little explanation. And the two “interludes”- intended as richly described “days in the life” of a networked, wired young person– simply fail, I believe, to illuminate, inform or influence minds (more about this at bottom). But, if you are caught up in the current intellectual debate about the value of online networking– if you are looking for helpful argumentation versus the Turkles and Carrs— this is a valuable book, collecting and sharing research based evidence and an idealistic vision for where we are headed as a society of increasingly networked individuals. And if you are looking for guidance on how to be a more effective online citizen, or netizen, this book offers good guidance. The title is Networked, but the argument is something a bit different: many of us are living now not in a networked society but lives of “networked individualism.” Because it is as individuals we are networked– at the very same time that we are more connected, we are less group-defined, less tied to tight networks such as churches and small town communities. 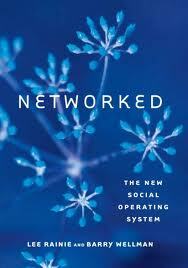 This new world of networked individualism is oriented around looser, more fragmented networks that provide succor. Small densely knit groups like families, villages, and small organizations have receded in recent generations. A different social order has emerged around social networks that are more diverse and less overlapping than those previous groups. The networked operating system offers new ways to solve problems and meet needs. It offers more freedom to individuals than people experienced in the past because now they have more room to manuevre and more capacity to act on their own. As opportune as this new network is for increasing the diversity and advantages of our ties to others around the world, it requires skills to negotiate. It is harder to trust information sources, lines are blurring between home and work and among various communication tools, greater transparency is the new norm, complicated as it is, and relationships are more fluid, less hierarchical. This is complicated, this new networked individualism- and it is not all for the better. But with the right skills and mindsets, great value can be derived. The implications for educators are clear: we have to assist our students and our colleagues in developing these skills. Three chapters lay out the three revolutions– the social network, the internet, and the mobile revolutions– but these three extended discussions don’t add much to those of us who have been paying at least a modicum of attention over the past thirty years. More helpfully, the chapter on “Networked Relationships,” which can certainly be profitably read and studied by itself by those wanting a better evidence base upon which to assess the new networked society, makes a compelling case. It uses, at length, the research from the Pew Internet and American Society studies, and those of the Toronto’s Net Lab, to provide substantial, trustworthy evidence for the analysis and argument. Contrary to some pundits’ fears that the internet was drawing people away from local communities, Pew Internet research found that most Internet activities have little relationship or a positive one to local activity. Internet users are as likely as anyone else to visit with their neighbors in person… bloggers are more likely to belong to a local volunteer association. Internet use does not pull people away from public places, but rather is associated with frequent visits to places such as parks, cafes, and restaurants– the kinds of locales where people are likely to encounter a wider array of people and diverse points of view. The evidence shows the opposite [of pundits’ fears]: the more internet contact, the more in-person and phone contact. Despite fears that the internet would curb relationships by luring people to the screen and away from in-person contact, the number of important relationships may even have grown. One survey found that Twitter users are more involved in social activities. Heavy internet users have had the biggest increase in their number of friends over a five year period. [The research is clear] the more people use the internet, the more friends they have, the more they see their friends, and the more socially diverse are their networks. To reiterate– for educators and others embroiled in the contemporary arguments about the value of technologically empowered relationships, reading and retaining the ideas and the data in this one chapter alone will be very valuable. Two other sections of the book stand out: Networked Creators and Thriving as a Networked Individual. Never pick a fight with a networked individual with strong internet and mobile connections. In the age of the triple revolution, anyone with an internet connection can create online content that has the potential to reach a wide audience. With all the different forms of creating content and the increasing ease with which people can do so, the boundaries between producers and consumers are becoming blurred in the network operating system– with non-credentialed amateurs participating in many of the arenas which were once limited to recognized and sanctioned experts. Every one of these bullets speaks to me as a blogger and, these past five years, and increasingly networked netizen. It is so rewarding to me that I have, in a way essentially entirely unavailable before the turn of the century, an opportunity to share thoughts widely and connect my thinking and my interests to those of many others– I find a community, meaningful collaboration, tremendous learning, and terrific empowerment. So you want to thrive online? The chapter “Thriving as a Networked Individual” will serve you well; interestingly, this is the same word chosen by Rheingold for his subtitle to Net Smart: How to Thrive Online, and if you are seeking to choose between these two guides, take the Rheingold. I shouldn’t play favorites: this chapter is, as a stand-alone document, also a very good framing for how to be empowered and effective in the digital world. 1. Invest in existing relationships via the Golden Rule so that help will be there when needed. Yes. Not just existing relationships, of course, but all developing relationships as well. When people reach out, individually or generally, online for assistance, try to help them out, especially when they share some in some kind of community of shared interest with you. Rheingold too makes this point too– “pay it forward,” he urges, and it will be returned. 3. Use technology to develop your access to a wider audience that can share your interests. 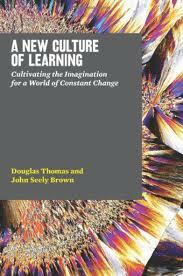 This, as with many other ideas here, overlap with the wisdom and counsel of John Seely Brown’s magnificent New Culture of Learning— cultivate a collective with those of shared interests for great growth and advantage. 10. Monitor and manage your reputation– your personal brand. Overall, the message from the surveys was that when people consider the trade-offs of disclosure vs. privacy in the digital era, the majority of them see advantages in disclosure and the prospect of being findable. People need to manage their attention more carefully than ever before. Effective networkers exploit this new digital environment more powerfully than those who get lost in their browsing or swamped by information inputs. graphic literacy: interpreting and contributing to digital conversation and creation. context and connections literacy: weaving together information and chatter flowing into our lives. focus literacy: capacity to minimize the distractions of the digital cacophony. skepticism literacy: evaluating effectively information found online. These are the precepts and the literacies we all need to thrive in the new, enormously advantageous, networked world, and they are what we as educators need to strive to learn first and teach second. Expanding on a point made near the top, I want to express again my disappointment with the day-in-the-life narratives in this book. Two of them are here, only two, and both them of them the diary entries of college women. I can understand the desire to capture the flavor of life as lived in this networked individualistic way– but these don’t succeed. First, they are wretchedly repetitive– why do both pieces have to be from college women in Toronto? Surely there is a vastly wider range of human beings who are living this life? How much I craved to read about the ways creative, connected, and superbly networked individuals are using the power of the network– and had no chance to see this life lived out. Speaking from within my own profession and my own online network, I would have loved to have read a day or two in the life of a George Couros or Eric Sheninger, educational leaders who are brilliantly to my observation balancing and reconciling heavy responsibilities in their “regular” life and thriving online– but examples could be chosen from any profession and any online community. Second– these two women use their networks for only very shallow benefits– arranging their social lives, primarily, and just a bit of information gathering. Now these are not at all bad elements of the networked individual experience, but they are only very small aspects of fully flourishing networked individualism. I would encourage– urge even– the authors and publishers of this book when planning a second or paperback edition to consider strongly swapping out one (or both) of these particular “interlude” narratives for similarly structured “diaries” of individuals who are fully flourishing and powerfully productive in the way they exploit and contribute to the practice of networked individualism. Walk, don’t run, to add this book to your list.